Wall sconces are the ideal choice for artistically lighting up the interiors without eating-up countertop space. Our sconces can provide ambient or task lighting, function as the primary light resource, or tastefully complement existing light fixtures. Available in a wide array of shapes & sizes, sconces are ideal for warm illumination or for highlighting an artwork. Choose sconces with a rustic, cast iron composition or those with a modernized, slender construction. From curvaceous sconces to those with straight lines, we have the sconce designs to light up your room, staircase, hallway or entryways. 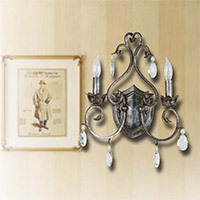 Wall Sconces There are 5953 products.